Sure Marvel's X-Men are the 'Children of the Atom', but whatever chemical reaction caused the creation of The Muppets inside the late Jim Henson's brain has never quite been rivalled. Now deviantARTist Rahzzah has brought the two school's of thought together, and all I can say is 'More! More!' and laugh with childish glee. The world can never have too much Beaker - you heard it here folks. Now as Marvel merchandising quickly get the Muppet crew on the phone, who is up for seeing Gonzo as Nightcrawler? Or maybe Fozzie Bear as Beast? with Marvel and the Muppets both owned by the House of Mouse, I'd love to see this happen. Hell, the park was marketing the hell out of Star Wars Disney characters when we brought the kids a few years ago (Mickey as Luke, Goofy as Darth Maul, and my favorite, Stitch as the Emperor). Good call Craig - I'd love to see the Muppets do the Fantastic Four - or at least a Pigs In Space parody. Oh that's hilarious! Can't you just see that one blue bird guy...can't remember his name...from the Muppet show. Always grumpy. As Magneto? I love the pic, and would like to see Fozzie in any character. Ema Frost would obviously have to be Miss Piggy. Sam the Eagle? absolutely. Or the Swedish Chef. Definitely Scooter as Toad. And thanks, Craig. I had a senior moment there. I think the Swedish Chef should be Gambit. What with all the tossing about. You know you never know what posts are going to get the most comments but I'm glad this one has stirred an imagine if! 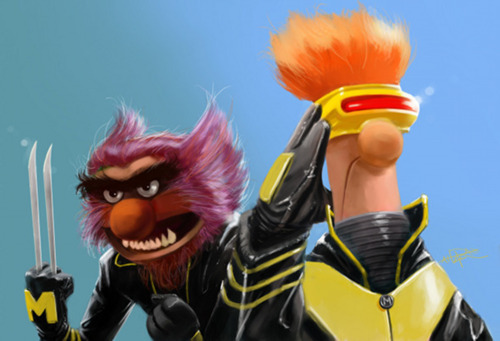 Now I know my life won't be complete till I see Swedish Chef as Gambit and Miss Piggy as Emma Frost. That last one especially is golden! Thanks for the comments crew! True, but you can never go wrong with the Muppets. I think I need to post up the movie poster and new Muppet movie trailer (I haven't posted anything for a few weeks, I've been slacking). I'm torn between Dr. Teeth and Bunsen Honeydew as Mr. Sinister. OMFG WHY WAS I NOT INFORMED OF THIS AWESOME?? I would pay to see THIS X-Men flick!